Kempen. 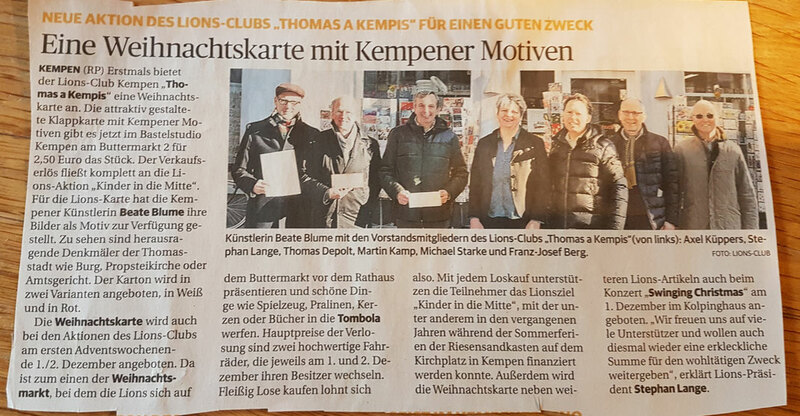 KEMPEN (RP) There will be a new exhibition in St. Peter-Stift. from Sunday January 28th, Beate Bume's paintings are to be seen in the foyer and the cafe of the home for the elderly in Auguste-Tibus-Straße 9. The Acrylic paintings of the artist from Kempen can be seen for three months up to the end of April. As it usually does, the series of art exhibitions in St. Peter-Stift is set up with contrasts. After the lovely, tongue-in-cheek drawings from Jürgen Pankarzthe contrast could not have been bigger. Beate Blume has a colorful, powerful and expressive painting style. The autodidactic painter loves painting sights of Kempen but also animals and landscapes. Carefully resembling their naturalistic subjects but in the most vivid colours, expressing imaginative power and a joy of life. Whereas Pankarz's sometimes sardonic sense of humour and all too human subjects are expressed in his works, the teacher takes us to familiar views that are re-created in a different light and in her very own style that makes the viewer curious. Beate Blume creates upbeat paintings without relinquishing depth. on a concept for liturgical music. "Kempener Kunst-Blicke" is the title of a perennial art calendar that Beate Blume has created from the views of Kempen she painted. The artist from Kempen is an English, P.E., IT and philosophy teacher at the municipal Luise-von-Duesberg Gymnasium. The self-educated artist has been painting since childhood. In her paintings she wants to express the beauty of her hometown artistically and enable observers to see familiar views in a different way. An exhibition at the town hall foyer is planned. The perennial calendar can be purchased in the local bookshops for 14,99 Euros. 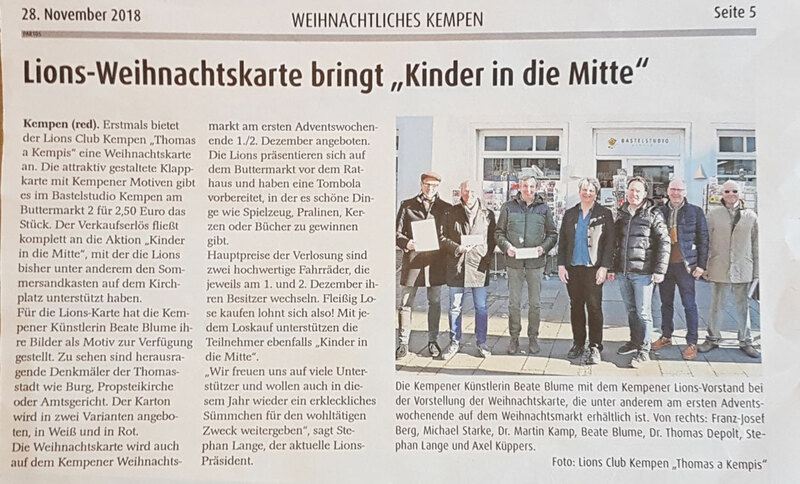 Source: "Stadt Spiegel Kempen" vom 28. Dezember 2016. ... Anyone who wants to make him- or herself (and the presentee) equally happy should definitely have a look at Beate Blume's new calendar. The teacher has recently published her debut artwork under the title "Kempener Kunst-Blicke" . Source: "Niederrhein im Blick" Oktober 2016.